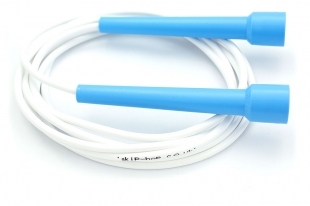 Though simple in construction the skip-hop speed rope is perfect for skipping. All of the skipping techniques and skipping tricks shown on our website can be performed with this rope - suitable for all ability levels - recommended for beginners & experts alike. Although light in weight & extremely flexible the skip-hop speed rope is stable & fast turning. Manufactured from solid 'scuff-resistant' 5.0 mm PVC cord together with 'grippy' & shatterproof polyethylene handles this rope is small enough to fit into your gym bag, school bag or even your glove box so it is always on hand. This rope is for skippers in the approximate height range of 5’ 5" to 6’ (1.64m to 1.82m). For smaller skippers the rope can be tied in one or more knots below the handles. This makes no difference to the usability of the rope but will make things a little easier if the rope is too long. or see our adjustable cable.